The app explosion continued through 2013, with digital storytelling and math being some of the most popular topics covered. Go to techlearning.com/jan14 to click through and learn more about each product. Buncee: Use this tool to create presentations or digital stories. Geddit: This app is used to assess student learning on any mobile device. EDpuzzle: Educators use this app to edit and crop a video and then add questions. Educators App: This app turns teachers’ Web pages into mobile apps for iOS or Android. eduClipper: This site creates a digital pin-board for curating and sharing educational content. Book Writer: This digital storytelling app allows students to add text, images, video, and even record their own audio. AR Flashcards: One of the most popular sites for Augmented Reality that allows educators to print out flashcards on a wide variety of subjects. Mystery Math Museum: Ideal for game-based learning, this app for students aged 6-12 teaches basic math while they rescue dragonflies. Level It Books: This app lets users scan a book and get a reading/Lexile level. UtellStory: This digital storytelling site allows users to upload audio, video, and photos. Quandary: This game focuses on students’ ethical and critical thinking skills while engaging them in a sci-fi/fantasy-themed setting. 30hands: This simple digital storytelling app allows students to add a picture and then record an audio narration to tell a story. Blendspace: This site lets teachers collect digital resources and share them with students. StoryLines for Schools: This iOS app helps students with sentence-building skills. iPracticeMath: This site inclues online activities in a wide range of math topics. SlideIdea: This iPad app lets users create engaging presentations and slideshows. Brainstormer: Teachers generate writing prompts in three different categories: theme, setting, and location. eduCanon: This site allows educators to edit a video and add quizzes. Alchemy SmartBinder: Use this site to create digital lessons. Super Teacher Worksheets: A fantastic resource for educators looking to create worksheets, printables, puzzles, and more. Animoby: This app turns an iPad into an interactive whiteboard. Wikispaces Classroom: This site offers a place where students can create digital content in a safe, controlled space. Story Creator: This digital storytelling app allows students to add audio narration to a story. Jack and the Beanstalk, a Mathematical Adventure: This game app teaches math with a unique take on the Jack and the Beanstalk tale. RoomRecess: One of my favorite new sites for educational online games. LaunchpadEDU: An excellent portal to support the use of Launchpad iOS app. Daisy the Dinosaur: A wonderful iPad app that teaches kids the basics of programming. Science Heroes 1: This game focuses on all five phases of digestion through 15 levels of play. Toonia Storymaker: This iPad app lets students create stories with 20 characters and 7 themes. Hopscotch: This iPad app lets students assemble code and then watch as characters perform their moves. Story Wheel: Another digital storytelling app that lets students spin a wheel and then record a story. Write About This: This digital storytelling iPad app provides writing prompts aligned to Common Core standards. Google Connected Classroom: This site from Google offers virtual field trips. Math Heroes 1: Basic Operations: Students travel through over 100 math levels while practicing. Google Play for Education: This new online site for education lets users download educational Android apps onto Google devices. Rewordify: This site allows students to enter text and then “rewordify” their sentences. eLearning Infographics: This is probably the best site around for finding educational infographics on any number of subjects. Brickflow: A site for creating presentations by turning hashtags into digital stories. Tabtor: Students watch video tutorials on a given subject and then write their answers on an iPad. SchoolsWorld: One of my favorite new sites for finding safe educational videos. Tangram Chess: This app allows students to recreate shapes by rotating them to the other side of the chess board. ClassXP: A new site that uses game-based learning to help motivate students. Easy Studio: This iPad app lets users create custom animations. The Time Tribe: Students are immersed in adventures that explore different cultures. StoryToolz: A wonderful site for finding and generating word prompts and other writing tools. Free Tiiu Pix: A great place for finding safe educational videos and slideshows. ChemDraw: A nice iPad app for HS/college students studying chemistry. YouTube Time Machine: This fun site allows users to use YouTube to travel through time. Graphite: A new site for finding sites and apps reviewed by educators. Gummii: Students create an avatar and solve math equations in a Minecraft-style 3D world. Cloudart: Create word clouds with this iPad app. The Lost Function: This in-depth math game lets students interact with characters to solve math equations. TypeKids: A great site to teach keyboarding. Experience Life: This iPad app introduces the different internal systems of the body. NuSkool: This site uses pop culture-based lessons for students in grades 6-12 in math, science, English, and more. Flowboard: Create stunning presentations with this iPad app. Brainscape: Use this app to create multimedia flashcards that can be shared to mobile devices. Shadow Puppet: This digital storytelling app allows students to add audio narration to a photo. Submerge: Students learn about gamification (game-based learning) in the classroom on this site, which includes detailed game reviews. Voki Classroom: This new Voki site allows users to create a talking avatar. Science4Us: A wonderful science curriculum for K-2 students. LivePrezo: This site lets users make their presentations interactive. Balefire Labs: One of the best new sites around to find detailed educational app reviews. The Human Body by Tinybop: A great site for teaching students about the human body. Quest: An innovative site/Windows app for creating interactive text-based adventure games. SimCity EDU: A new site based on SimCity that is perfect for game-based learning. Power My Learning: A wonderful site for students to find educational games, activities, printables, and more. BrainRush: A site for creating flashcard-style games. Tellagami: Use this iOS app to create a talking avatar that can then be placed in a story. Fotor: A very powerful and user-friendly site for editing photos. Weavly EDU: A great site designed for classrooms to have students create video and music mashups and presentations. Phrasalstein: Students learn vocabulary in a medieval/horror setting. Basher’s Presidents: This app teaches about the US Presidents. 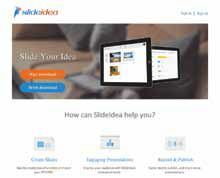 Lucidpress: Use this site to create multimedia collaborative documents. Mathalicious: This site provides lots of math resources and lesson plans aligned to Common Core standards. Taught It: This free site allows educators to share all sorts of media. Playback: Use this iPad app to create screencasts that can then be shared via Dropbox or exported into an mp4 file. Explania: A fantastic site for finding educational animated videos on a wide variety of subjects that can then be embedded into a site or blog. Metta: A great site for creating video lessons. QuestBase: Educators can use this site to create quizzes, tests, puzzles, etc., and then publish them online for students. Math Live: An innovative site for teaching different areas of math through animated videos. Educade: A great place for educators to find a wide variety of resources. Sight Words Hangman: This is a fun way to teach students how to read and recognize words. Teachers can review all word lists and even generate reports. EasyDefine: Use this site to upload words and get a definition, synonym, flashcard, and more. Screenhero: This site/app allows users to not only share their screen with others, but remotely control another person’s computer problems. appoLearning: Another great site for finding detailed reviews (on a 100% scale) of educational apps. NicerTube: A fun way to share YouTube videos and remove all comments/links. Copyright Kids: An excellent resource for students, parents, and teachers looking to find out about all issues pertaining to copyright. TeachQuest: A new social network for educators to share resources and collaborate with parents. QR Code Maker: A simple iOS app for creating QR codes. ScootPad: Use this site/app to collaborate online and track and analyze student data. Teacher Gaming Network: This new social network is dedicated to gamification in the classroom. Smart Kit: This site lists safe educational games and puzzles in a wide range of subjects. Jukeboxlessons: A new site for educators wanting to teach or tutor online through Google Hangouts or Skype. GazziliMath: A fun iOS app for preschoolers learning about math. Lessonwell: An interesting new site that allows educators to create digital lessons based on different types of media (photo, videos, audio). Memofon: A wonderfully simple site for brainstorming and creating mind maps. Chem Pro: This iOS/Android app teaches chemistry with over 80 video lessons, an interactive periodic table, and flashcards. David Kapuler is an educational consultant; read his blog at cyber-kap.blogspot.com.